Commercial and Business Internet Services Provided by CRWIFI Ltda. As most people know there are unlimited ways of approaching your network needs and that is why things become complicated and expensive. Most companies that specialize in certain network services are very set in their ways and don't always have the most economical and efficient methods to provide for your specific needs. We approach this from your side of the equation with equipment cost, methods of implementation, and specific ideas to get the maximum benefit from the time and money spent to accomplish the task. Primary Internet Service Provider How about an automatic backup network system that guarantees you the highest possible uptime in Costa Rica? We can supply you a backup network connection to the internet, or your own remote location. This connection will work with your existing network/internet and in the event your fiber, DSL, cable, satellite, or other type of service quits, then ours will fill in until which time it comes back online. This is a must have service for Call Centers, Online Services, Sports Books, Online Gambling, high demand network connections, financial institutions, VOIP applications, credit card processors, and even the small businessman that runs a home based internet business. We can also even connect multiple different internet connections from different providers. 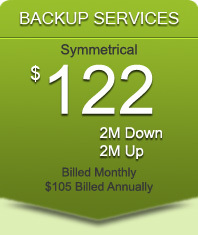 This means by use of a few providers you can have 100% uptime. Yes, it is possible. Network Management (what can we do that the others can't)We have the tools to take care of what's important and do it for the right price. Here are just some of the basic common applications requested. Manage your bandwidth usage allowing for many users on a small connection. Did you know that you can have 20 to 40 users on a single 4Mbps DSL or cable connection and still have fast internet access? You can control who has access to what on the internet and/or your internal network. As a business you want to limit access to social networks, video services, email, and chat so that your employees will work more efficiently. You also need the ability to make reliable Internet based phone calls (VoIP, Vonage, Skype, MagicJack, Asterisk, etc.) while your network is in full use without call quality issues. Remote access to your network is always available including VPN's. If you need your employees or contractors to work from remote locations we have the answer. 1. Our network is made up of clients that have dynamic network needs. We have learned ways to meet those needs quickly and economically. 3. Customer service is the core of CRWIFI's success. We have both English and Spanish speaking personnel available in our office and on the field. You will be treated with respect by a courteous staff member be in person or on the phone. If for some reason you are not, we will compensate you by a credit to your account. Commercial clients can opt for 24 hour support if needed and guaranteed minimum response times for onsite support or maintenance. 4. Our prices on many services that we provide to commercial clients could possibly save from 10% to 75% off that of our competitors. Example: You have multiple internet connections and you want a router to use your 4Mbps DSL connection for primary service with a 2Mbps backup from a cable company. In the event the DSL goes down the system will automatically switch to your cable internet connection. A pre-configured router that is just plug and play for that situation is under $200. 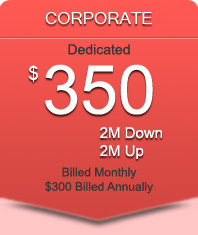 Four megabit business connections can be as low as $100 per month in some situations. Routers for office management configured to your needs start at about $300. How is this possible? Just ask! 5. We guarantee our service with a full money back guarantee for 30 days*. If you're not happy with us then you deserve your money back. We have provided this guarantee to our residential clients for the past couple years. 6. We make things simple by offering multiple solutions that are affordable. If we can't, We are here for you and would enjoy the opportunity to make your network do more than you ever thought possible. We like to say "Yes we can"� to all your network needs, but we are not afraid to say no. So whether you own a small business composed of one person, a call center with 100 stations, or a chain of retail outlets scattered across the country, we welcome your business. Find out who we are today by giving us a call and see what our technicians can do for you. * All costs for the services that we provide including installation, equipment, labor, and monthly fee for up to 30 days from the time the equipment and/or service is provided is refundable unless otherwise stated in your contract or on your invoices (this applies starting May 1st, 2011). We will design a firewall for your specific needs. Typically this is done by blocking all traffic and then allowing only the IP addresses, protocols, and ports that you request. This insures a very strong level of security. We can port forward from the public side of the network back to your LAN if needed. An example might be for a security system, small server, or remote desktop access to a local machine. In this specific case we are referring to round trip ping times into the United States and the consistency of the response time. This means you will have excellent performance with VoIP and other types of voice communication such as Skype or Google Voice. If we do not supply you the service in which both parties have agreed upon, we will refund 100% of your install fee and your first months service. This applies to all commercial installs unless other arrangements have been made. This guarantee is for the first 30 days of service. If your service does not meet the 99.90% uptime guarantee we will pay you (credit your account) four times the amount of service down time. 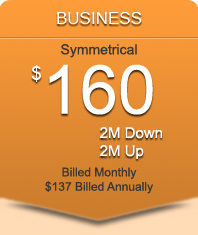 $210 / 730h = .29 cents per hour for regular service. 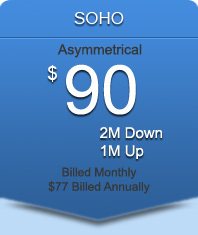 If you choose to pay by the month at the full rate with no discounts your service will renew every month automatically. This way you don't have to pay a deposit or the first and last month up front. You will have access to one of our top level support technician 24hours per day. This will include two personal cell phone numbers, main office number, and two email addresses. Our techs can assist you with your questions, make recommendations, verify system operation, modify router settings, and/or send out a technician to work directly on our equipment if needed. This is one on one support with a real technician. Control which IP's, protocols, and ports have higher priority. We will teach you how to make basic mods to our router on your LAN. This way you can make those needed changes very quickly with no delays for things like queues, dhcp server, access restrictions, vpn users and passwords. We realize that your uptime is very important. In most cases for commercial accounts we will be on site the same day in which you call. We can't work on the equipment under heavy rain or any lightning conditions. Most of the time we know what is wrong and can tell you what the situation is at the time of your call. Higher grades of service gets you faster response times. We will explain what a router can do and how it can benefit your company. We will then work with you to design a internet access plan for each and every computer/networking device on site. This will include up to four hours of design and programming during the first month. Each month there after your install we will give you up to thirty minutes of router support/programming time, or three router based calls (whichever comes first). All of business plans can be used to Access remote or local VPN servers. Certain service plans though include us setting up a VPN server on your network using our router. This will allow you to have full access to your LAN from virtually any internet connection in the world. We will configure a router and setup a public IP address if your require.